If your closet is cluttered and in disarray, you've probably considered learning how to build closet storage systems. While closet storage kits can be bought most home improvement stores, a custom closet organizer with shelves and drawers, tailored to your closet's size will ensure that you maximize your closet space. One of the benefits of designing a custom closet organizer is that you can arrange shelves, drawers and rods to suit your needs. Before designing your storage layout, consider your closet's size and what kind of things you'll store in the closet. The first step in designing your closet area is to consider what will be stored in the closet. If the closet will be used to store linens and blankets, you will need more shelves and drawers than rods for hanging clothes. A closet that will serve to store clothes and shoes should have drawers or shelves that are built low (or high) enough to accommodate for hanging clothes, including long dresses or coats. Pantry closet projects may require narrow shelves. How to build a closet storage system will depend on the width, height and depth of your closet. Use a tape measure to determine these specifications. Measure the width by placing the tape measure against the closet's back wall. Measure this wall end to end. Next, measure side walls on both sides of the closet to determine the closet's depth. Take note of the space above the closet door as you measure the closet's height. Draw a blueprint of your closet's design on a sheet of grid paper. Be sure to note the closets width, height and depth measurements. The door (or doors) should also be depicted on your plan as this will play a role in how you arrange the closet. Sketch out your desired placement of rods, drawers, cubes, shoe units, hutches and shelves. Don't forget that the inside of the closet door is a great place for hooks or suspended baskets for additional storage. Closet organizers can be constructed from wood, wire, aluminum and a variety of other materials. Ultimately, the choice is yours. When choosing a system, consider how much effort you want to put forth into the project. You can either build a storage system from scratch or buy prefabricated storage units and arrange the components according to your design layout. The two most common types of closet storage systems are wire and wood. Wire shelves, racks and complete wire closet organizing kits are sold in home improvement stores. Mount wire shelves to the wall with support brackets. Use vertical support poles for shelves that need to hold more weight. These organizers can usually be assembled with a screwdriver. If mounting shelving units into drywall, be sure to have drywall anchors on hand. Wood is a popular choice for closet organization projects and there are a variety of types of wood to choose from. The cheapest option is plywood, which can be painted and sealed for a finished look. Solid wood, like cedar, mahogany, oak and maple may cost more, but this material is both sturdy and attractive. 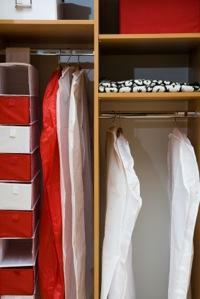 Prefabricated wood closet organizers can be bought at home improvement stores. To build your own, you'll need wood boards, a hammer, nails, screws, mounting brackets and a drill. Determine the layout of the closet storage area. Buy building materials and closet organization pieces including shelves, rods and brackets according to your closet's measurements. Secure the shelves to the brackets. Install rod or dowel hardware and put the rods in place. Now that your storage area is built, go ahead and set your items into place and enjoy your newly organized closet space!